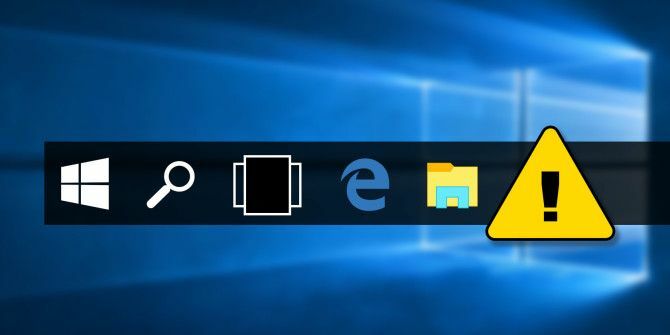 The taskbar is home to lots of useful links, including the Start menu, pinned apps that you use every day How to Change Taskbar Icons for Programs in Windows 10 How to Change Taskbar Icons for Programs in Windows 10 If the program icons on your Windows Taskbar are looking a little bland, you can easily customize them. Here's how to set a new icon for any desktop program. Read More , system icons such as volume and network, and the Action Center Why Use the Windows 10 Action Center Instead of the Settings App? Why Use the Windows 10 Action Center Instead of the Settings App? If you get in the habit of using the Action Center instead of the Settings app, you can save yourself a lot of clicks, time, and frustration. Read More . Unfortunately, it also takes up some prime screen real estate. If you’re working on a 32-inch monitor, you probably don’t think much about it, but on a device with a smaller screen (e.g. used when traveling), the taskbar doesn’t need to be visible all the time. Thankfully, it’s possible to hide the taskbar, but the way to do it isn’t immediately apparent. Let’s take a closer look. In the panel on the left-hand side of the screen, choose Taskbar. Find Automatically hide the taskbar in desktop mode. The taskbar will now vanish from the screen. If you need to access it, just move the mouse pointer to the bottom of the screen, and it will pop up. The Taskbar section of the Settings app has some other useful options. Automatically hide the taskbar in tablet mode will hide the taskbar when you’re using a tablet, and Use small taskbar buttons dramatically reduces the amount of space the taskbar needs without hiding it permanently. Do you keep the taskbar hidden or do you think it’s more convenient to keep it visible at all times? Let us know what you think in the comments below. Or you could just right-click the taskbar and click taskbar settings. Thanks, I've been trying to figure out how to do this in Windows 10! I'd much rather have the taskbar hidden to free up screen space.